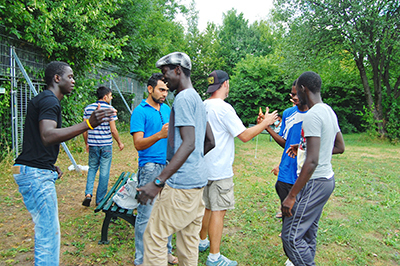 The Move Project, a collaboration between the Institute for Aesthletics, contemporary dancer Birgitt Bodingbauer, and the Munich Refugee Council, worked with unaccompanied minors and family members located at the Bayernkaserne detention center in Munich Germany on a five-week long physical play project. 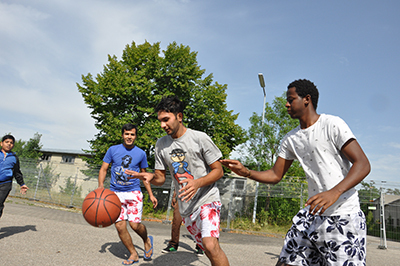 The Bayernekaserne center is one of the most notorious refugee detention centers in Germany. On the site of an old army barracks, the center is a make-shift, fenced-in complex that house a vastly fluctuating number of detainees. In the spring of 2013 it swelled to unbearable numbers, prompting a hunger strike by teenage residents in protest of their living conditions. We arrived to a more hospitable, yet still unfavorable living environment, and quickly set to work recruiting participants, which was not hard given the lack of activities for detainees. We started out playing a number of "new" games, i.e. not soccer,- basketball, frisbee golf, American football, and handball. During the second session, we had enough players to set up an ultimate frisbee game; soon after someone stepped on the frisbee and shattered it. As I went to get another, a Somali kid threw an American football into the mix and we had invented our first game: ultimate frisbee with a football! The game was an instant success, and as we played more, a community started to develop. Every day people wanted to play this new game, soon called Malaka (after the word every one of these refugees learns after migrating through Greece ), and it started to flesh out into a sport. People got better; teams developed strategies, less collisions occured and more points were scored. More importantly, when we played, the oppressive environs of the camp, the separation of ethnicities, the uncertainty of each detainee's future, temporarily vanished. Moods raised, people intermingled, and we started to have meaningful conversations in the midst of this playful atmosphere. Playing these games created a level playing field where people were participating only because of their desire to play. As such, they interacted with each other arbitrarily yet naturally, without hierarchy nor motive. It is in these situations where social engagement flourishes. Malaka Day One from Aesthletics on Vimeo. We held a culminating event, New Sport Day, at a local football club to showcase the great work the guys put into the project. We invited the general community to the grounds to view the first official game of Malaka, and debuted two new teams: the Berliners and the Super Indians. The teams were conceived and designed by two Afghani brothers who were unfortunately transferred to a different center a week before the game, and were never able to see their designs realized. When the players came into the locker rooms and found these uniforms waiting for them, they were unbelievably excited; for so long they have been treated as invisible citizens, now their roles were reversed, they were on display, the main focus of attention, if only for a couple of hours. They took advantage, playing their hearts out in front of a small yet rowdy late August crowd, who were impressed with their ability and creativity. While the Move Project did not solve any major problems, or directly address the adversity and hardship that many of these kids face on a daily basis, it did confirm a truth: when people play they are happy. People must be happy, in order to have hope, to deal with others, and to survive.